Call me crazy, but I actually like the factory Mitsubishi stereo head. Ok. Except for the stereo security code thing. After 13 years of sloshing coffee down the face, dust and vibration while 4-wheeling the only problem I've had is the CD button no longer works. I dare anyone to find an aftermarket unit that will withstand that kind of abuse. Anyway, no CD button wasn't really a problem until recently when I found and purchased a factory 10 CD disc changer. I didn't think I'd have any problems - surf eBay and find a used replacement. No such luck. 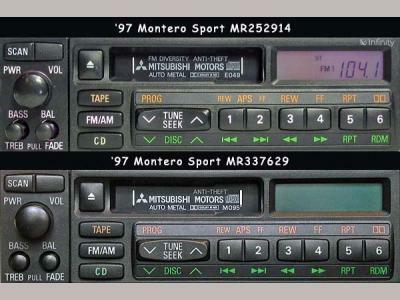 I knew there were two stereo head units for the 1997 Mitsubishi Montero Sport. The Infinity head PN# MR252914 and the standard or non-Infinity head PN# MR337629. These two head units are virtually identical. The only externally visible difference when installed is the tiny Infinity logo in the upper right hand corner. Even when uninstalled and examined the only real difference that stands out is the missing DIN outlet on the back of the non-Infinity unit and the slight difference in weight. Eventually, I did find an Infinity replacement on eBay and made plans to install it in the spring. Then a new project vehicle came along. The new 1997 Montero Sport was missing the factory stereo head so I made plans to have my 'replacement' installed in the new project vehicle. I figured I'd eventually find a replacement for my 'replacement' and life would go on. No one could tell me what the differences were (if any) between the Infinity and non-Infinity head units and at the time there was no way to tell if my new project vehicle had originally came with the Infinity or non-Infinity stereo installed. Of one thing I was sure. 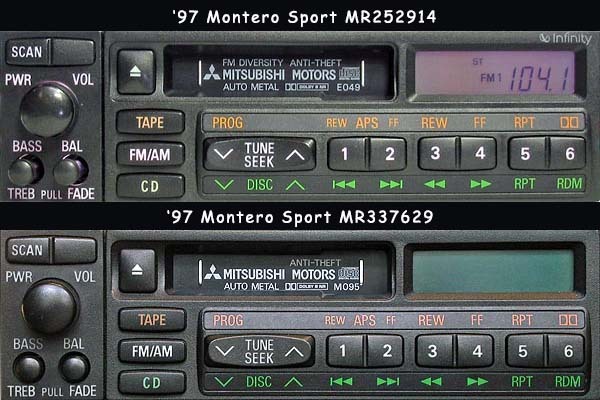 My originaly SAS'd '97 Montero Sport did come with the Infinity stereo head, six speakers and remote under dash single CD player, and since I was the original owner I knew no changes (besides the installation of the 10 CD disc changer) had been made. I had a baseline to work from, at least. Once the installation of the 'replacement' head in the new project vehicle was started a major problem immediately appeared. A total lack of audio. Everything else appeared to work, including the newly installed 10 CD disc changer, so the natural assumption was that the 'replacement' was somehow damaged. I was unwilling to spend another 6-8 months trying to find another used head that might or might not work so I opted for cutting my losses and ordering a brand new factory head unit from Vintage Parts. Vintage Parts was nice enough to over night the new stereo head unit so it showed up the next morning. There was only one problem. Upon installing the new head unit the same problem appeared. No audio. Everything functioned correctly but no sound. ?!?? After several phone calls and a lot of Web surfing a conclusion was reached. The factory Montero Sport Infinity stereo requires the factory stereo amplifier to function. Apparently my original '97 Sport has the amplifier even though the dealership told me when I purchased it that it did not. Tells you something about trusting sales people, huh? Vintage Parts was kind enough to allow me to return the new head and send me the non-Infinity stereo head unit. The next afternoon the non-Infinity unit showed up and after a close examination of the original used Infinity unit and the new non-Infinity unit the new unit was installed. After all the headaches I fully expected this unit to not work, but in that I was disappointed. Everything worked 'out of the box' including the audio. The difference - apparently the ONLY difference as far as I can tell since the two systems sound exactly the same - is the Infinity head unit requires the Mitsubishi amplifier and the non-Infinity does not. Both head units will operate the under dash Single CD Disc Player and/or the rear cargo area 10 CD Disc Changer and both will power the four, six and eight speaker systems installed from the factory. So, some usefull information. The Mitsubishi 10 CD Changer is located in the rear cargo area and is accessible through either the right or left side storage door. Which door seems to depend on whether the factory amplifier is installed. Its on the passenger side in my '97 Infinity Sport and the driver side in my '97 non-Infinity Sport. After removing the console and under dash CD player there may be up to two DIN cables running to the rear of the vehicle. For Infinity Montero Sports one will be for the amplifier. For Infinity and non-Infinity Sports the other DIN cable will be for the factory 10 Disc CD Changer. I say 'may' because having these doesn't mean that the equipment was actually installed. Most cars are pre-wired for accessories to simplify addition by the dealerships. So, why did I go through all this hassel and expense instead of having something aftermarket installed? First, I wanted the remote 10 CD Disc Changer for long trips and it doesn't work with after-market head units. Second, I wanted to retain the under dash single CD player which also doesn't work with after-market stereo heads. Third, I wanted to be able to use my stereo without it interfereing with or interference from 97-99 cup holder. Most importantly, I wanted to retain a stereo head unit that I already know will withstand 500,000 miles of dripping coffee, dust, heat, vibration and shock. Over all I'm pleased. Hopefully, this stereo head will work as well and long as my Infinity head in my original '97 Sport.